My Newest addition to the smallbore collection! I could not believe what I was seeing. 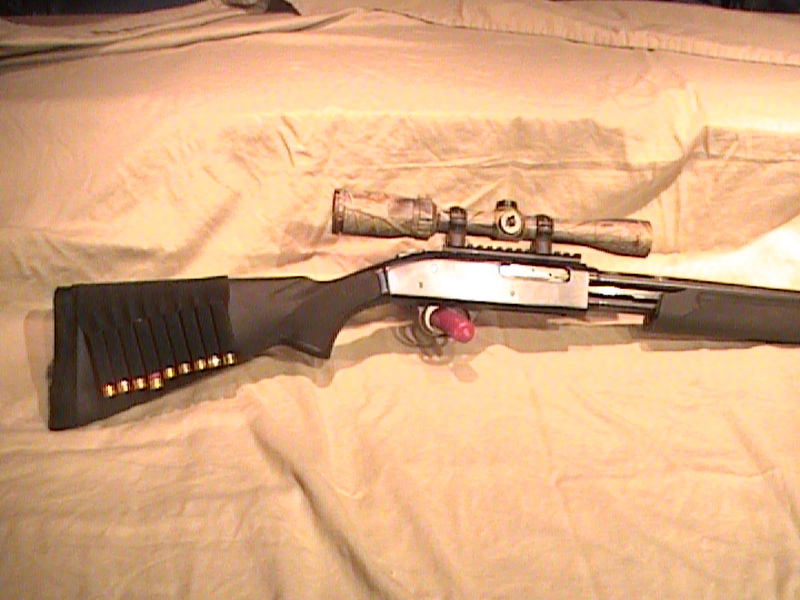 A Mossberg 500 .410 shotgun for sale – cheap too! So I picked it up. Nice little firearm. Black synthetic furniture, ventilated 24″ full-choke barrel. Shoots up to 3″ ammo – perfect for what I wanted. The first thing I noticed was the sloppy pump-action. Not as tight as an 870, but serviceable. So I threw some Brenneke 3″ slugs in just to check the grouping I could get at 40 yards (My max range for deer with the .410). 2″ group at 30 yards aint bad! High and to the right using the standard plane of sight. So I took her home and installed a TASCO PRO-POINT RED-DOT with zero magnification. I also worked up a handful of 148 grain slugs I use for hunting. A 3″ BPI Hull, 209 primer, 11 grains of Red-Dot with Winchester wad cut down to serve as a sabot (my slugs are .358 dia.) and topped with a very nice roll-crimp if I do say so myself. This is a better .410 deer load than the pumpkin ball rounds I load for self defense and Coyotes. So I am off to the range (sandpit) to test ‘um out – will post some pic’s tomorrow. Previous What are .410 Shotguns used for?